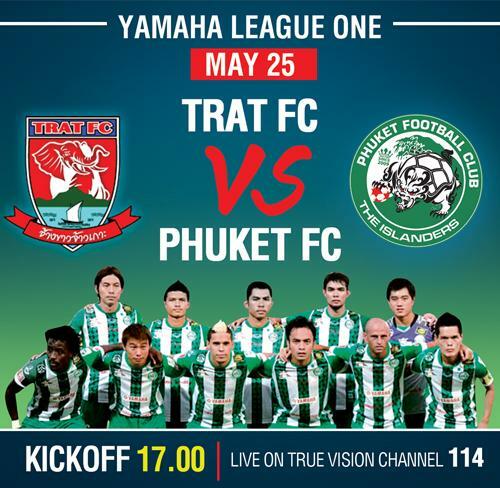 PHUKET: Hungry for a win, Phuket FC are on the road this weekend, having bused it up to the area near the Cambodian border to take on Yamaha League One (YL1) newcomers, Trat FC tonight. The match, to be played at Trat city’s Central Sports Stadium with a 6pm kickoff, will be broadcast live on Siam Sports cable channel 114, and is both sides’ 12th match of a 34-fixture season. Fans in Phuket can catch all the live action on the big screen at Nok Sanarm Sports Cafe, across the street from Surakul Stadium on Wichit Songkhram Road. Additionally, loyal Phuket FC expat supporters club the “Mushy Peas” will meet at Washy’s at the Tropical Sands Guest House in Rawai, where the match will also be aired on the big screen. Going into the match, Phuket are in 5th place of the 18-team YL1 league, while their opponents, Trat, nicknamed the “White Elephants” are in 10th. Trat FC were promoted from the second division, having finished runners up (behind champions Ayutthaya FC) in the AIS Division 2 promotion playoffs last year. Of the last five matches, both sides have claimed six points – winning one, drawing three and losing one. The team that both sides lost to was top-of-the-table Air Force United. Unfortunately, Phuket’s leading scorer, Brazilian striker, Luiz Eduardo Purcino (6 goals), better known as Dudu, will be benched due to a leg injury he picked up in last week’s match against Rayong (see below), with the club’s Facebook announcing that Dudu will not play. Fans need not panic, as Brazilian midfielder Judinho, Japanese defender, Yusuke Sato veteren Ivorian defender, Nenebi, as well as speedy Thai striker Chana Sonwiset, were all confirmed to be on the bus to Trat. The island’s soccer team, Phuket FC, let a two-nil lead at home slip away in a 2-2 draw against Yamaha League One (YL1) rivals, Rayong FC, last Saturday evening in Phuket Town. The match, both sides 11th of the 34-fixture YL1 2013 season, was played in front of a crowd of 2,753 (not counting several hundred children and youth admitted for free), at Phuket’s Surakul Stadium on Wichit Songkhram Road. The crowd, dominated by green, red and black-shirted home fans, also included a contingent numbering in the dozens of yellow and blue clad Rayong fans, who had bused it down from the Eastern Seaboard province the previous evening. Rayong is a 13-15 hour bus ride, about 1,000 kilometers from Phuket. Going into the match joint 5th (with BBCU) in the 18-team league, Phuket – players, fans and staff alike – were expecting nothing short of victory against newly promoted, (and bottom of the table) Rayong, nicknamed the Wild Horses. Following the less-than-spectacular opening exchanges, the Islanders took the lead in the 30th minute, through a spot kick by midfielder Geoffrey Doumeng. On the other side of the pitch, Korean striker Kunsik Choi proved somewhat of a nuisance for Phuket’s defenders, but Ivorian stalwart Nenebi Slyvester, along with dependable Japanese defender Yusuke Sato were able to eliminate any real threat for hometown-hero keeper, Kamphon. Phuket’s leading scorer, Brazilian striker Luiz “Dudu” Eduardo failed to threaten Rayong’s backs or their keeper, Phuket native Leuchar Jantawong, who was once a reserve Phuket keeper. The home fans’ mood was high as Phuket went in to the half time with a lead of 1-0. In the second half, Dudu was subbed for what appeared to be a minor injury, and replaced by Georgian forward, Giorgi. almost certain at that point…almost. The Wild Horses went on the attack and the home side had no choice but to adapt to a defensive formation to ward off a determined Rayong side, who dominated possession. The visitor’s attacking front finally paid off in the 73rd minute with a goal by Cameroonian defender Henri Walther, who converted a well-placed corner kick to score from his position in the center of the area. Phuket were unable to retake control of the match, but held on to their lead up to the end of 90-minute regulation. To the dismay of home fans, the equalizer came three minutes into the five minutes allocated for injury time, through Rayong’s Nattawut Khamrin. Positioning himself at the end of a perfectly-weighted cross into the area, Nattawut diligently penetrated a tired Phuket defensive line, prompting the visitors’ bench to explode as though they had just won the World Cup. Phuket dug deep trying to find a last minute winner, and an on-target shot by Doumeng, who was subsequently voted Man of the Match, looked promising, but it went straight into the gloves of Rayong’s Phuket-born keeper, Leuchar. The single point might as well have been three points as far as the away supporters were concerned, with fans lighting red celebratory flares in tribute to their second-half comeback. Despite a mood of defeat overcoming the disappointed home fans, the draw and its point did ensure that Phuket remain in fifth place, now with 18 points, seven points behind league leaders Air Force United. Keep checking our online Phuket Sports pages or join our Facebook fan page for the latest local, national and international sporting news.